There is an age-old myth that we humans only use 10% of our brains. The theory is so prevalent it’s become sort of an urban legend. It’s something people seem to believe without question even though there is no actual scientific evidence to support it. It’s easy to see why people might be so willing to accept such a hypothesis since so many of us have likely felt that we’ve fallen behind our true potential somewhere along the way. Mind expansion is a common theme in science fiction, going back to one of the seminal classics, Flowers for Algernon. 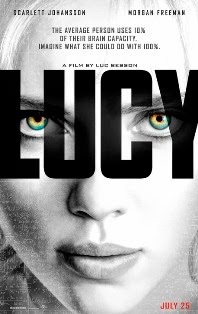 Luc Besson’s Lucy, starring Scarlett Johansson, is the latest entry in this well-worn theme. While Besson does a great job of staging a taught and quick-paced thriller, the story itself falls short in providing any kind of depth whatsoever. Lucy is a college student living in Tapei who unwittingly becomes a drug mule after her boyfriend of one week tricks her into doing an errand for the violent drug lord Mr. Jang (Min-sik Choy). When the bag sewn into her stomach begins to leak, Lucy finds that that this new drug, CPH4, literally expands the mind. With her sudden increase in brain function, Lucy quickly outsmarts the thugs holding her and sets out for revenge on Mr. Jang. Lucy gains some cool abilities like learning to speak Chinese in an hour and the ability to control radio waves, televisions and cell phones. But there is a downside to this increase in brain power, Lucy’s cells begin to divide at an alarming rate and she deduces she only has about 24 hours to live. Suddenly we are thrust into a Crank style cat-and-mouse game where Lucy must race against the clock find the bad guys and find renowned brain expert Professor Norman (Morgan Freeman). Unlike Crank, Lucy is racing to save her life, but only to impart her sudden knowledge onto the professor by turning her physical form into a computer. If it sounds preposterous, that’s because it is, however the film moves along at such a quick pace, there’s not a lot of time to think about whether it makes sense or not. Lucy doesn’t have to spend any time searching for her antagonists, because they are after her as well. They want their drugs back, and are willing to travel halfway around the world and shoot up entire cities to get it. While the accelerated cell regeneration is a clever reminder that the brain controls our entire body, not just the ability to think, it’s also the downfall of what could have been a more clever plot. Instead of exploring Lucy’s new found powers, we are treated to once action sequence after another. It’s fun, but not all that fulfilling. A couple of interesting concepts are introduced, including the idea that Lucy begins to feel less human as her brain function increases. The film also suggests that instead of just increasing our ability to learn, increasing our brain function to 100% would unlock all the secrets of the universe. Could it be possible that we hold the secret to life itself within every atom of our body? It might have been interesting if the film had spent more time with these concepts, but this is more of an action film with a sci-fi theme. There’s plenty of excitement to keep the viewer entertained, and Scarlett Johansson does a good job with both the action sequences and the human side of things. However, for a film that is about using more of our brain potential, it doesn’t give us anything to think about.